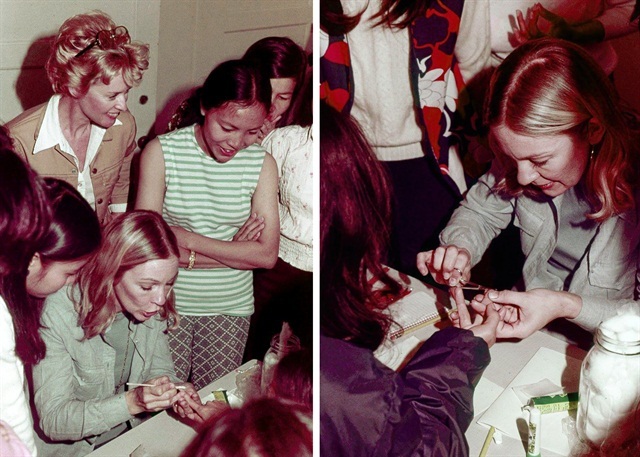 Actress Tippi Hedren is credited with helping Vietnamese women find their way into the nail industry, by flying her manicurist, Dusty Coots, in to Hope Village, a Sacramento-area refugee camp set up during the Vietnam War, to teach the women how to do nails. But photos of Coots and her account of the story have been left out of the spotlight — until now. Meet Dusty Coots Butera, the nail tech and first instructor of the “Original 20” Vietnamese women in the nail industry. Butera has been doing nails quietly ever since, over the last 45 years. She has been a booth renter in Montage Hair Salon in Sherman Oaks, Calif., for the last two decades. Butera’s husband, Massimo Butera, was an amateur photographer who accompanied her on her flights to visit the refugee camp. He took hundreds of photos of the refugee camp life and of Butera showing her new students how to do nails, a few of which we’ve shared here. Now at 80 years young, Butera continues to work as a nail tech with a dedicated clientele, many for over 40 years. And she would have continued to quietly go about her nail business drawing no attention to herself had it not been for an event held last October, Bellacures and OPI honoring Tippi Hedren. 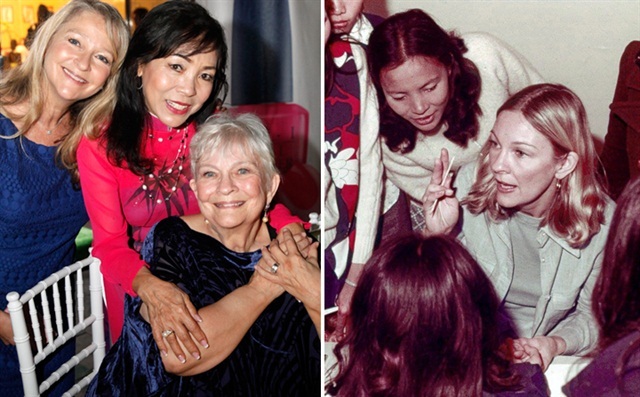 Somehow word of the event reached Butera and organizers were quick to invite her to the ceremony where she reunited with Hedren and Thuan Le, one of the Original 20 women she taught. “I didn’t know how this affected so many people, even though I know how much it affected me. Manicuring did so much for me,” Butera says. See an interview with Dusty Coots Butera in Adele Pham’s upcoming documentary, #NailedIt: Vietnamese & the Nail Industry. A shortened version of #NailedIt is screening at Viet Film Fest on Sunday, Apr. 17, 2016.